Basenji is a tool which indexes your removable media such as CDs/DVDs and USB sticks and keeps a history of the data on each media you add to its database so you can later easily search / browse for something on your CDs/DVDs or USB sticks without actually plugging them into your computer. Do you have a lot of audio CDs? Basenji has that covered too, along with metadata extraction (image dimensions and mp3 tags) and thumbnail support (so you can see a thumbnail for your indexed data without having the media inserted into your computer). 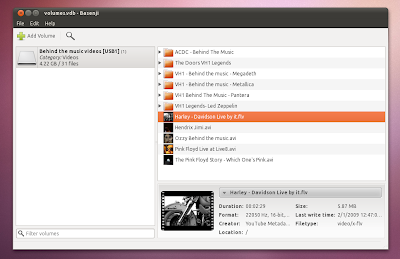 Further more, Basenji is crossplaform and there are binaries available already for both Windows and Linux (Ubuntu). The database can easily be exported so you can move it to a different computer and if that's too much hassle, you could always use Dropbox (or UbuntuOne) to directly synchronize the database between multiple computers. Basenji can also import Gnome Catalog databases which has ceased development. Once installed, launch Basenji via the Applications > Accessories > Basenji menu item. The above PPA is for stable Basenji builds but if you want to run the latest daily build, there's a PPA for that too (but note that it may be unstable). You can find the Basenji daily builds PPA @ Launchpad (it's only available for Ubuntu 10.04 Lucid Lynx at the time I'm writing this post). To install Basenji on Windows, once you download the Win32 archive, see the Readme (important, as you'll have to install Gtk# for .NET). Download Basenji portable volume indexer (Windows binaries and source files are available).